Entering the season finale for the 2011 IZOD INDYCAR Series, the tempo was his with the tour's return to the carnival-like atmosphere of Las Vegas. 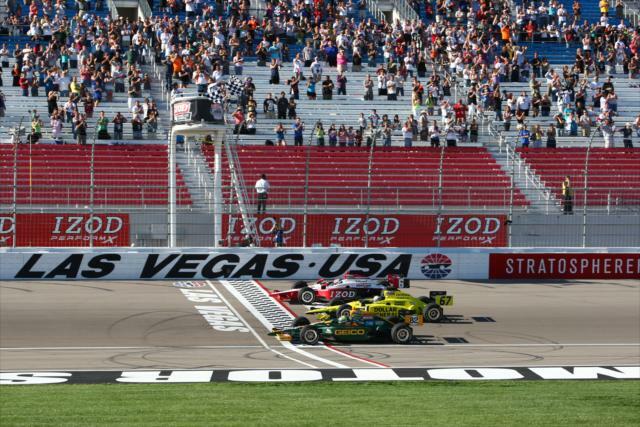 The Las Vegas Motor Speedway's 300-mile IZOD INDYCAR World Championship would be the place where many major honours were decided. For the second-straight year, Will Power and Dario Franchitti were to do battle are top place in the driver's overall point standings. A tight rookie of the year point fight between American JR Hildebrand and Canadian James Hinchcliffe was prepared to reach a conclusion. Finally, there was one final event on the 2011 IZOD INDYCAR Series title for which 34 drivers were placed in the race field to win. One of those drivers entered into the Las Vegas event was 2011 Indianapolis 500 winner Dan Wheldon. Completing what was a magical feat in late May, Wheldon joined Sam Schmidt Racing and the #77 team for the series' final 2011 race competing with a considerable perk of a 5-million dollar prize if he would have won the Las Vegas Motor Speedway round. As the field was staged for the last 2011 IZOD INDYCAR Series race, the excitement would be far too short-lived with emotions quickly turning by lap 12. Through one of the most packed field of open wheel racing cars the series has seen since the 1997 Indianapolis 500, there was immediate issues from the drop of green with competitors fighting for position during such an infant race. As several near misses took place on the 1.5-mile Las Vegas Motor Speedway including a brushing of wheels between Alex Tagliani and Ryan Briscoe, the two escaped the incident without wrecking. With packs racing three-wide, even the slightest misinterpretation on-track would have caused a serious incident. Heading into turn 1 on the 12th lap in the event, a worst case scenario took place. On the outside travelling through the first corner, the #17 of Wade Cunningham made minor contact with the #02 car of James Hinchcliffe who had recently checked up in reaction to action in front of his Newman/Haas Racing machine. Unable to retain handling of his compromised Indy car, Cunningham slid and began a fast pile-up. Travelling in excess of 200 miles per hour, cars were instantly swept up in the initial contact taking in total 15 Indy car vehicles. Jay Howard, Paul Tracy, JR Hildebrand, EJ Viso and Pippa Mann were among some of the drivers sitting in wrecked race cars as a red flag quickly flew over the race track. IZOD INDYCAR title contender Will Power was also caught up in the melee ultimately handing the 2011 championship to Dario Franchitti. Out of the car, Power would be alright but later attended the an off-site hospital with back pain concerns. With safety crews and emergency vehicles rushing to the massive crash scene around turn 2, Mann and Hildebrand were conscious but in need of further medical attention outside of the Las Vegas Motor Speedway. Taken to the University Medical Center by road ambulance, worry from many race observes surrounded the #77 car that was driven by Dan Wheldon. Sustaining heavy damage, Wheldon's car was eventually centered by a yellow tarp as the condition of the driver was unknown. As time passed and other drivers involved in the big wreck at Las Vegas were discharged from the on-site medical center, Paul Tracy detailed that doctors were surrounding Wheldon. Later, IZOD INDYCAR Series television coverage on ABC received confirmation that Dan Wheldon was on a recently-lifted medical helicopter to the same medical center as Hildebrand and Mann. With a track sitting quiet under a red flag with clean-up as well as track repairs to the safer barrier wall and track surface itself proceeding, the concern for the 33-year old British driver grew. After an hour under the red flag period, the INDYCAR Series called a closed-door meeting with all drivers in the media center. It was almost two hours after the horrible 15-car crash when word was officially relayed that the two-time Indy 500 and 2005 INDYCAR champion Dan Wheldon had succumbed to his injures. "INDYCAR is sad to announce that Dan Wheldon passed away from unsurvivable injuries. Our thoughts and prayers are with Dan and his family. INDYCAR, its drivers and teams have decided to end the race. We will run a five-lap salute in honor of Dan." Ten minutes after Bernard presented the news, drivers of the remaining 19 vehicles were assembled to perform a makeshift yet tasteful memorial to the now-departed young racing legend. For five laps, the Indy car pack circulated the Las Vegas Motor Speedway race in a three-wide formation. A gripping emotional time for the fraternity of IZOD INDYCAR Series drivers as they reentered their vehicles with knowledge of a lost competitor, and in many cases friend. As a checkered-flag flew as an end to the Las Vegas race. However, for drivers, race team members, race fans and the racing families (especially the now grieving family of Dan Wheldon), the flag does nothing to resolve the pain of losing a fellow competitor.